Phrenology is the science which studies the relationships between a person's character and the morphology of the skull. It is a very ancient object of study. The first philosopher to locate mental faculties in the head was in fact Aristoteles. Several typologies have been defined, linking physionomy with character. The study of the face, physiognomony, has been particularly studied by the 18th century Swiss author Lavater. The real scientific Phrenology, which established a direct link between the morphology of the skull and the human character, was discovered by the Austrian physician Franz Joseph GALL (1758-1828). Gall put the foundations for an anatomic caracteriology. He was one of the first to consider the brain as the home of all mental activities. That the brain is composed of many particular organs as there are propensities, sentiments and faculties which differ essentially from each other. That the form of the head or cranium represents the form of the brain, and thus reflects the relative development of the brain organs. These statements can be considered as the basic laws on which the science of Phrenology has been built. Through careful observation and extensive experimental measurements, Gall was able to link aspects of character, called faculties, to precise brain localisations. The most important collaborator of Gall was Johann SPURZHEIM (1776-1832), who successfully disseminated Phrenology in the UK and the USA. Other important authors on the subject in the last century include the Scottish brothers George COMBE (1788-1858) and Andrew COMBE (1797-1847). George Combe was the author of some of the most popular works on Phrenology and the hygiene of the mind, like The Consitution of Man or Elements of Phrenology. 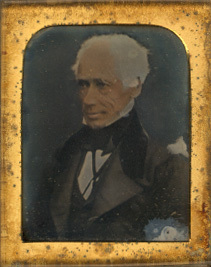 The picture right shows a daguerrotype of George Combe. (Thanks to Miguel Angel Cuarterolo from Argentina for this image). The American brothers Lorenzo Niles FOWLER (1811-1896) and Orson S. FOWLER (1809-1887) were the leading Phrenologists of their time. Lorenzo spend much of his life in England where he set up the famous Phrenological publishing house of L.N Fowler & Co. In the early 19th century, Phrenology gained a rapidly growing interest. Some scrupless people did however abuse the science for commercial purposes, and the Victorian period saw the emergence of Phrenological parlours which were closer to astrology, chiromancy, and the like, than to real scientific characterology. Unfortunately, those con-men have done a lot to stain the image of Phrenology as a real science, and their bad influence lives up to today.